vADASdeveloper provides an infrastructure for developing algorithms for advanced driver assistance systems (ADAS) and automated driving. The tool reduces your workload in developing sensor data fusion applications. The runtime environment acquires sensor data, logs it and can replay the data for stimulation. Here the sensor data and the results of algorithms are clearly displayed in a bird's eye perspective and in the video image. vADASdeveloper accelerates the development process, increases the quality of the systems and gives the automotive ECU developer a high degree of flexibility. Easy to incorporate C/C++ and MATLAB/Simulink software components. Image processing for systems used in lane or traffic sign recognition, etc. Any typical sensors, like cameras, radar, LIDAR, CAN, etc. can be conveniently integrated and graphically linked. You can also flexibly integrate customer-specific sensors. Clear and configurable display of results with superimposed camera images (acquired objects, text overlays, driving lanes), bird's eye perspective, diagrams, etc. Supports development of sensor data fusion via "BASELABS Create"
Data fusion code for series ECUs via "BASELABS Create Embedded"
As of Version 3.0, it is possible to install multiple vADASdeveloper versions in parallel. vADASdeveloper projects of Version 2.0 or higher can easily be converted to the target version using the integrated project converter. Sensors that send variable numbers of objects/detections in the same network signal groups or messages during a cycle can now be easily converted to dynamic object lists at the CANape component's output pin. New converters for sensors that reuse the same group of signals for each object in a list, e.g. ARS-408 radar sensors. New converters for sensors, that use the same signal group from different messages for each object, e.g. Mobileye DevKit. GFX Vector – 3D vectors for the visualization of object speed, acceleration values, etc. Precise time synchronization of gPTP/IEEE 802.1AS-capable data sources and UTC timestamping of the network/measurement data from a GPS master clock (requires BRICK-PC hardware with XTSS extension). The timing of LIDAR point clouds and objects coming from sensors with their own GPS receivers for timestamping can now be precisely correlated with the other signal values (for example, bus systems or protocols). This is possible thanks to the new support for the UTC time base in LIDAR sensor components (IBEO HAD, Velodyne, Quanergy). 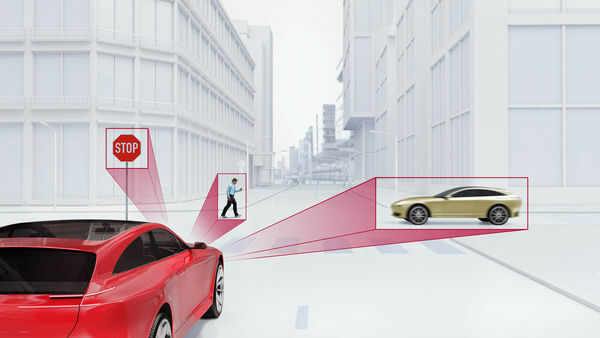 This permits synchronized measurements across multiple vehicles. Time-consuming post-synchronization, in particular in reference sensor applications, is no longer necessary. Sensors and other ECUs that send their information as AUTOSAR PDUs on GbE/100BASE-T1 can now also be used as data sources for algorithm development. The signals from the PDU containers are configured using ARXML. The optionally available Runtime License allows the execution of all vADASdeveloper applications. Example: Recording live data in many vehicles or validation of algorithms with large quantities of offline data in test environments.